Living up to its name, Typhoon Lupit — meaning cruel in Filipino — zigzagged around the rain-soaked northern Philippines on Friday, keeping weary residents on edge and forecasters guessing about its next move. The third successive storm in a month has been hovering for several days near the coast and inland mountains, sending thousands to seek shelter following two back-to-back typhoons that killed nearly 1,000 people, most of them buried in dozens of mudslides. Lupit's erratic direction baffled forecasters and frustrated the local media who kept predicting its landfall every day. The weather bureau said in a nationally televised briefing Thursday evening that Lupit would ram into northeastern Cagayan province early Friday. After crawling for the last two days, it barreled on course to hit shore then stalled again Friday, delaying landfall by another day — or two, or three, said chief forecaster Nathaniel Cruz. The reason is two high-pressure areas that sandwiched Lupit from the South China Sea in the west and the Pacific Ocean in the east, each pulling the storm in its direction, Cruz said. Typhoons usually slice through the northern Philippines from the Pacific and exit through the South China Sea. The archipelago nation, known as the welcome mat for typhoons, gets about 20 a year during the rainy season from June to December. Lupit weakened overnight and was packing winds of 75 miles (120 kilometers) per hour and gusts of up to 93 mph (150 kph), Cruz said. It was still a dangerous system that could drench the north of the main island of Luzon on the heels of the worst flooding in the Philippines in 40 years. 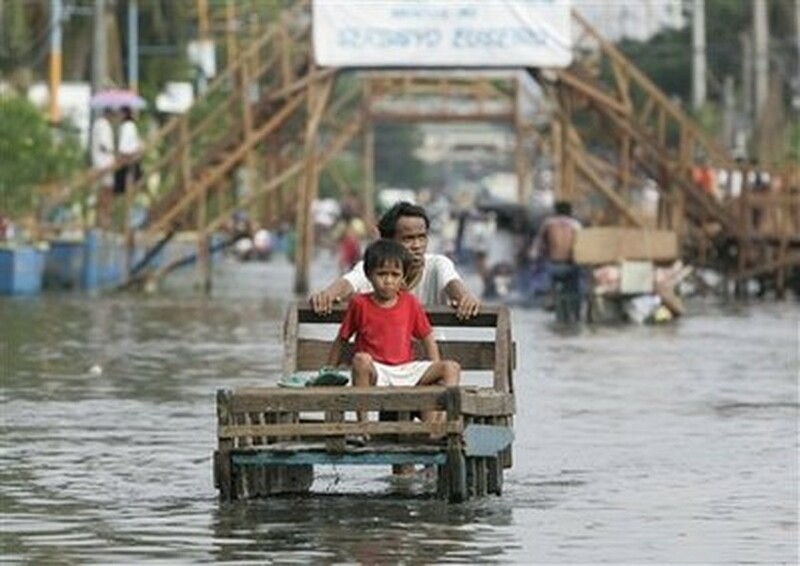 Tropical Storm Ketsana on Sept. 26 inundated much of the capital, Manila, and surrounding areas, including the country's largest Lake Laguna, killing 464 people. It was followed by Typhoon Parma, which unleashed mudslides along the Cordillera mountain range Oct. 3, leaving 465 dead. For the past week, army troops and disaster-relief officials have ferried tons of canned food and clothes and moved rubber boats and helicopters along the coast and the interior. At least 1,500 residents living along the Cagayan River and its tributaries were moved to high ground, said provincial Gov. Alvaro Antonio. Another 1,000 people left their homes in Appari township, including some 200 after a wave surge collapsed a 65-feet (20-meter) high sea wall in San Antonio village early this week.